LEXINGTON, Ky. (Nov. 30, 2011) – As the final weeks of the semester draw to a close, students graduating in December and those who graduated in August still have an opportunity to participate in UK’s winter Commencement ceremonies. The University of Kentucky invites August and December graduates to attend the appropriate ceremony for their degree level. Each degree recipient, recognized by name, will cross the main stage to be congratulated by President Eli Capilouto and the dean of their college. 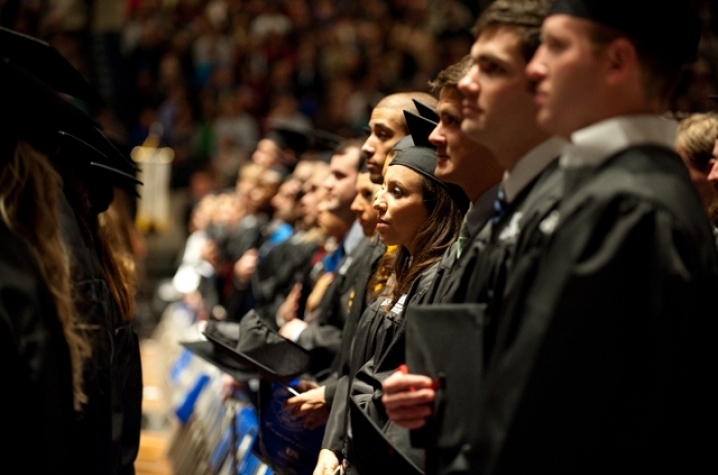 Bachelor’s degrees will be conferred at 6 p.m. in Memorial Coliseum. Degrees for doctoral and master’s candidates will be conferred at 1:30 p.m. at Memorial Coliseum. Undergraduate students click here to register. Graduate and professional students click here to register. The priority registration deadline is Thursday, Dec. 1, and students who register by this date will have their names displayed on the screen as they walk across the stage. Students are welcome to register after this date, but there is no guarantee that their names will still appear on the screen. Academic regalia are available from UK Bookstore. Graduate and professional regalia may require a special order, so please contact the UK Bookstore as soon as possible to check for availability.